We meet regularly at the same time in the same place in a small circle of maximum 8 to 9 people. This is how a basic setting for conducting psychotherapy in a group can be described. A therapy in a group has few advantages over the individual psychotherapy. You have more chances to interact with different people. Inhibiting and painful patterns can come out sooner and be loosened faster. You benefit not only from your own experience, emotions and thoughts but also from those of the other group members. 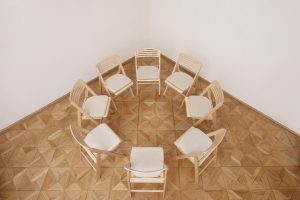 Group therapy can also save your time and money. Group meets once in a week. And it has a catalysing effect for inner psychic processes. Therefore it is possible to reach your therapeutic aims faster as it would be in the individual therapy. The therapeutic work in a group is also as confidential as the work in the individual sessions. That’s why there is practically no issue that cannot be treated in a group.